It’s hard to remember a game show having more hype than NBC’s The Wall. To some extent this had to do with NBA superstar LeBron James and his long-time business partner Maverick Carter co-producing the show, according to The Hollywood Reporter. But also, the show itself was supposed to revamp the game show genre for a new generation. A Washington Post article compared it to a “high-tech game of Plinko,” but also mentioned the iconic trivia show Who Wants To Be A Millionaire in assessing the nature of modern game shows. The idea was that most game shows have similarities between them, and while The Wall was striving to be different the comparisons can’t be avoided. Who Wants To Be A Millionaire is probably the most popular game show from the 21st century, and as such it is The Wall’s main competition, at least in terms of reputation. Sadly, the same comparison isn’t so kind to The Wall. This is a show that is as much about couples’ chemistry and random chance as it is about trivia, which makes it less compelling than Millionaire. A couple comes out to answer a few questions and drop a few balls down the towering grid to see how much money they’ll start the show with. Then the couple is separated. One person is sent into isolation to answer questions with no idea of what’s going on with the board (meaning they have no idea what the stakes are for a given question). The other person is left out in front of the audience to choose which of seven slots to drop balls into to determine the amounts of money that are at stake. It sort of sounds interesting, but the first place where it falls flat is the strategy of the front-and-center partner’s ball placement. In the premiere, we watched a contestant go to painstaking lengths to place significance in the numbers one through seven, as reasons for dropping the ball where she dropped it. Eventually she’d covered all the numbers, and while the game (as well as peg drop probabilities) claim that there’s some logic to it, the outcomes seemed entirely random. Allegedly, a ball dropped toward the right of the grid (seven) has a greater chance of landing on a massive number of money, while one on the left (one) won’t strike it rich but is also less likely to land on a $1 or $0. As you’re watching you’re fully aware that the contestant’s decisions are random, and that the way the ball drops is nearly as chaotic. Compare that to the strategic decisions that surrounded the trivia in Millionaire and the whole thing seems a bit less thrilling by comparison. While The Wall relies purely on chaos and chance Millionaire actually involved some strategy and if you knew a few facts about the show it could change the game. Contestants had to know which lifelines to use and when. They had to know when to risk a guess, knowing they’d reached a threshold at which a wrong answer wouldn’t send them crashing back to $0. In one breakdown of game show strategies Foxy Casino explains that the “Ask the Audience” lifeline was right 90 percent of the time, making it an invaluable advantage to save for later rounds. There was some actual reason and logic to playing the game that went well beyond knowing the answers to the increasingly difficult multiple choice questions and this raises the takes for the audience as well as the contestants. This might all be fine if The Wall were more about the trivia, or if it were particularly fun to watch contestants stew over their random decisions. Unfortunately, neither is the case. 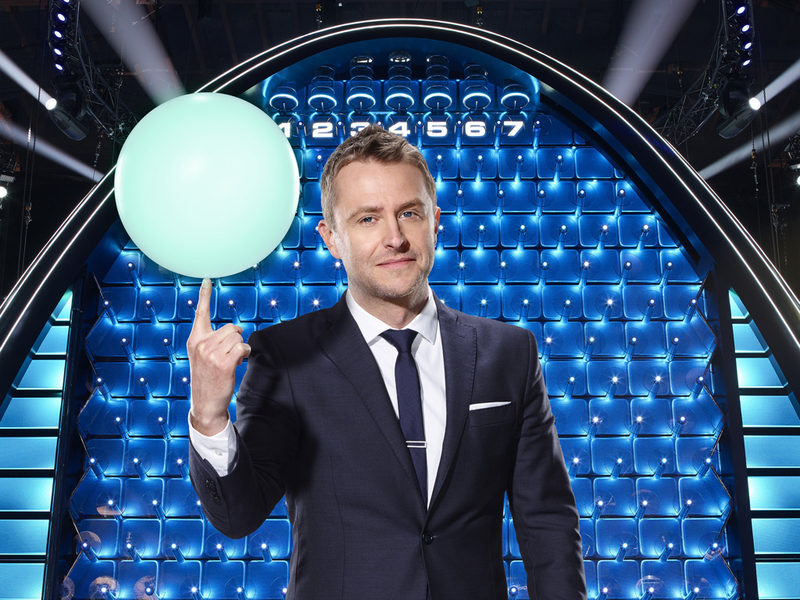 Much as host Chris Hardwick may try to keep things engaging (you almost feel bad for him out there), it’s not at all fun to watch contestants trying to decide where to drop the ball, or cheering on a glowing ball as it drops and bounces around the pegs. It might be okay a couple of times, but by the end of a 45-minute episode you just want to fast-forward to see if they won money. Even worse, the trivia feels entirely marginalized. What made Millionaire (and many other game shows) terrific was that you felt like you could play along from home. You got to engage with the material and answer trivia questions, and possibly even fantasize about your own prize money. In The Wall the trivia feels like an afterthought. We get through all the over-produced nonsense and then have to squeeze in a few trivia questions before we can progress to more nonsense. It may be popular for a time simply because of how much publicity it’s gotten, and because we fundamentally tend to enjoy watching other people win money. But The Wall ultimately feels like a giant whiff for NBC and likely won’t see anywhere near the success of better shows like Millionaire.